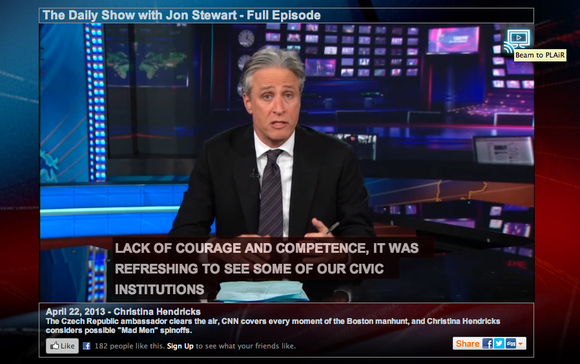 There’s a ton of streaming video content on the Web, but I think most of us would agree that it’s a more enjoyable experience to watch that content on a TV rather than a computer display. At least that’s what Plair Media is hoping with the release of its $99 eponymous video streaming stick. Set-top boxes like the Roku 3 give you access to hundreds of channels of content, but the Plair is going after a different type of user—the kind who runs a 20-foot HDMI cable from their laptop on the couch to the back of their HDTV. Using a Chrome plug-in, you can choose video content from the browser on a Mac running OS X 10.6 or later or a Windows PC running XP or later to “send” to your TV. The reason behind the quotation marks is that you’re not streaming the content from your computer to the Plair—the way you would with AirPlay and an Apple TV, say—but rather telling a particular website to send the content directly to the Plair. (The company actually uses the word beam, but that’s not really right either.) 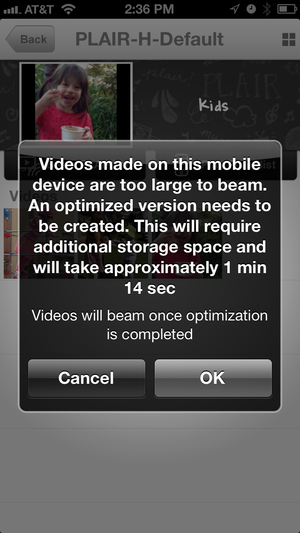 There’s also more limited functionality from iOS 4.2 or later- and Android 2.3 or later-running mobile devices, and support for streaming videos and photos directly from your computer or mobile device. The Plair atop an Apple TV for comparison. To get started, you plug the Plair (available in red, black, or blue) into an HDMI port and connect the power plug to an outlet. The odd shape of the device made it hard to plug into one of the side-positioned HDMI ports on my HDTV while another cable was plugged into the other, and I was forced to plug it into in the bottom port. I could see the shape being a problem on other TVs as well. Setting up the Plair in Chrome. I tried repeatedly to set up the Plair in the TechHive offices using the Chrome plug-in on my Core i7 MacBook Air and the latest stable version of the browser, but even though the configuration wizard saw the device, it failed to connect to it on every try. Eventually I switched to the iOS app and had better luck. Testing again at home, I was able to finally use the browser for setup after a few tries. The company says mobile devices are more reliable because of how they’re designed to look for wireless networks on a constant basis. Once everything was set up, The Plair auto-played a GoPro demo reel of HD adventure footage, which looked great on two different TVs. For those interested in the specs, the Plair has a 1GHz ARM processor, 1GB of DDR3 RAM, 802.11n Wi-Fi, and a built-in GPU to support 1080p video. To choose content from a computer, you just visit a website. Plair has a list of featured channels including ABC, CBS, Fox, A&E, SyFy, and USA, but if there’s supported video on a site you visit, you’ll see a blue icon (a TV with a play button on it and some lines representing a wireless signal) in the upper right corner of the video. Click it and choose to beam the video, and it will start playing on your TV. Usually. When it played, the results were usually quite good—although I encountered some delays before the video would begin. I played video from a number of different sites, including NBC, PBS Kids, Comedy Central, and YouTube. The quality of the video depends on what’s being served as well as the robustness of your Internet connection. And because the content isn’t coming from your computer, you can do other things with it—or even shut it down—without impacting the video. You won’t be able to control playback at that point, but it’s a neat trick to try. Selecting a program to beam to the Plair. What’s not supported? 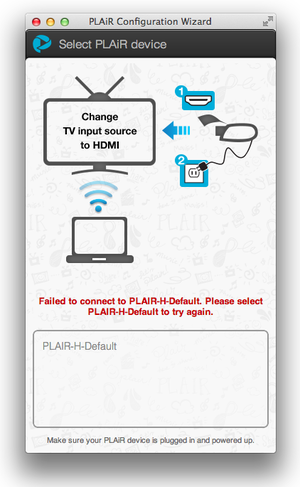 Currently, you can’t play anything from Netflix or Hulu, and there are other sites with video players that the Plair can’t deal with. The company plans to add support for additional sites, and says it will respond to requests as well. And then I had times where all I got was a white screen when I tried to play something. I had to unplug the Plair and then plug it back in to get everything to work. The company says the white screen is due to Flash crashing (insert your own joke here) and that restarting Chrome should reset things (it didn’t for me), but is working on a better fix. Another time I started playing a show, then my computer could no longer find the Plair. I had to quit and relaunch Chrome, re-authorize the plug-in, and then connect again. Channel selection on the iPad. On mobile devices, you have access to a more limited set of content, although the company is planning to release an API for other content providers who want to add Plair support. As a test, a few coworkers and I enjoyed “Watch Rachel Dratch Run The Julia Roberts Obstacle Course!” from the Funny or Die website, as beamed from my iPhone 5 to the HDTV in our lounge. To control playback, you pinch out on your mobile device’s screen to bring up a set of remote controls. Pinching in gets rid of the remote. Streaming local videos to the Plair. As with on the computer, you can send photos and video directly from your iOS or Android device to your TV. After selecting a bunch of images, I was able to watch a slideshow of pictures I took with my wife on a hike at San Francisco’s Lands End. Swiping the iPad’s screen advanced easily to the next slide (although, oddly, starting the photo playlist flipped the orientation on my iPad’s screen for no apparent reason). The Plair is an interesting concept, but in its current form too buggy for primetime. When it worked, it was pretty cool. But unfortunately it was pretty much hit or miss. Although I understand the company is going after a less tech-savvy person than your typical set-top box user, for most people the same money would be better spent on an Apple TV or Roku 3.